Newlite offer what we consider to be one of the best PVCu sliding patio doors available on the market today. Our innovative high quality doors benefit from years of testing and design. Therefore you benefit from one of the best and most affordable inline sliding doors, guaranteed to performs reliably for years to come. The benefits of PVCu sliding patio doors. If you desire large glazed doors giving you great views out to your garden, patio or terrace our patio doors are ideal and fit for purpose. Perhaps you are restricted by space and cannot have hinged opening doors. Again our sliding doors offer solutions. All our door slide on a single track meaning they will not take up any valuable space inside or outside your room. This makes them perfect for patios, room dividers, garden rooms, conservatories or porches. 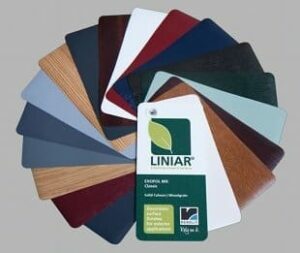 A wide choice of colours and accessories for your patio door. You may choose the clean crisp lines of our gloss white but we also offer over 19 other colours and finishes including woodgrain effects. For your patio door handles, you also have a huge choice. Choose from polished, satin, gold or metal handles as well as white or black. Whatever your requirements, Newlite will create a bespoke and individual sliding door individually made to your precise sizes and specifications. Our latest generation and up to the minute sliding PVCu patio doors are a major departure from old PVCu or metal patio doors that often had weak points in their security. Our doors are tested and designed to be highly secure when locked, keeping your home safe. They cannot be prised apart or have the sliding panels lifted off from the outside. Our doors feature unique innovations such as built-in anti-jacking, multi-point locking and anti bump cylinders. You, therefore, have the peace of mind that your doors can be as secure as your windows. As well as this you get outstanding weather performance and long term reliability. Six point multi-point locking with secure cylinders and handles. One piece head section stopping the door from being removed or lifted off. High security at the corners with inbuilt support rails. Industry-leading handle tested to the latest standards. Internal maximum security glazing beads. Superb thermal and weather performance. Our doors have been tested to meet all the extremities of the British weather. Tested to the latest weather and performance standards they are weathertight and sealed. A choice of woodgrain finishes on our sliding doors. Slim lines and effortless operation. Newlite has installed our quality patio doors to a huge number of local homes. Contact us to find out how we can help you make the most of your space with our market-leading sliding patio doors.